America’s Founding Fathers saw in the bald eagle many of the characteristics that American people exhibited during the Revolutionary War. Today, the bald eagle is an enduring symbol of America’s power and freedom. 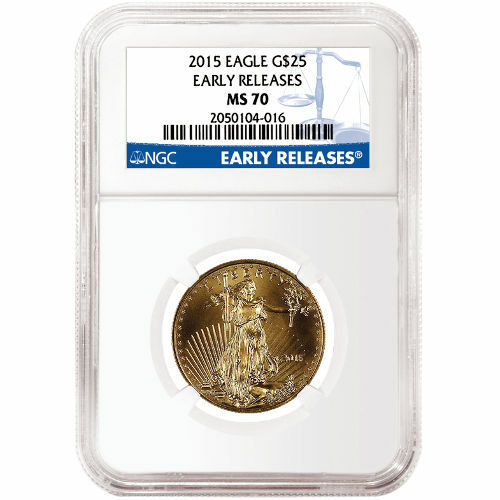 Now, you can own a 2015 1/2 oz Gold American Eagle coin with an MS70 grade from the Numismatic Guaranty Corporation. Silver.com has Gold American Eagles from the early release range, meaning the coins arrived within 30 days of their release by the mint in 2015. Actual gold content of 1/2 oz. Minted by the United States Mint. Available in perfect MS70 condition from the NGC. Reverse artwork created by Miley Buseik; obverse art based on Augustus Saint-Gaudens’ design. Ships in an NGC plastic slab for protection. The Gold American Eagle is the official gold bullion coin of the United States. Congress authorized the production of the coins following passage of the Gold Bullion Coin Act of 1985. Under the terms of the act, all coins produced for each series must use gold sourced from within the United States. Augustus Saint-Gaudens crafted the image for the obverse side of the coin, while sculptor Miley Busiek created the image on the reverse. On the obverse side of the 2015 1/2 oz Gold American Eagle coin is Saint-Gaudens’ image of Lady Liberty. On the coin, she is depicted walking toward the viewer with a torch in her right hand and an olive branch in her left. Engravings include “Liberty,” the year of minting, and a star representing each state in the US around the rim of the coin. The United States Mint was established in 1792 as the official minting facility of the federal government. These 2015 1/2 oz Gold American Eagles have a grade of MS70 from the Numismatic Guaranty Corporation. An MS70 grade means a coin has perfect minting, with no abrasions and a brilliant strike. Here at Silver.com customer service is one of our top priorities. Anytime you have questions about a Silver.com product or the online purchasing process, our associates are waiting to speak with you at 888-989-7223. A representative can also be reached through live chat or email to answer any of your questions.